The symposium began with a poster session as engineering students presented on various energy sources such as solar, wind, hydro, shale gas, biomass and nuclear. Celik followed by discussing how the symposium evolved into reality and his vision of becoming the lead regional institution on energy issues. The featured afternoon event was the geothermal vs. wind debate. From an original pool of 14 teams debating alternative energy sources, two finalists emerged. 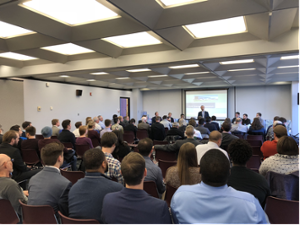 Six SIUE senior mechanical engineering students squared off in the debate. Allen Bilbruck, of Carrolton, Pratik Lamsal, of Kathmandu, Nepal, and Tyler Schlecht, of South Roxana, presented the case for geothermal energy. Meanwhile, Lane Davis, of Mendon, Nathaniel Kirby and Kurtis Nemsky, of Edwardsville, presented the case for wind energy. With representatives from higher education, alternative energy, corporate leadership, public utilities, energy consultants and environmental agencies serving as judges, the geothermal team was judged the winner. ‪The debate was open to the public, and individuals from different fields including political offices, higher education administration, representatives from Chambers of Commerce, and energy professionals from the corporate world were invited to attend. For more information, contact Celik in the SIUE Department of Mechanical Engineering at scelik@siue.edu. Photo: Serdar Celik, PhD, associate professor of mechanical engineering, addresses SIUE’s inaugural Energy Symposium.